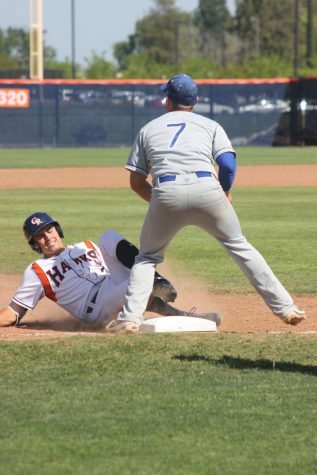 Freshman pinch runner Adam Castelan slides past Ohlone College's sophomore catcher Aeryk Hernandez's tag in the 10th inning, scoring the winning run for the Hawks. 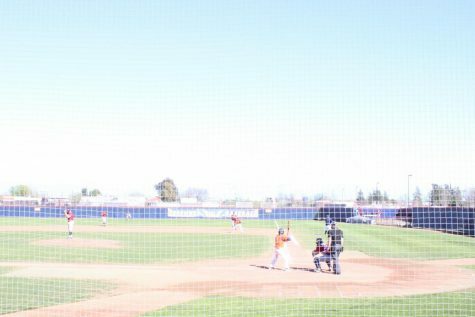 The Hawks’ baseball game against the Ohlone College Renegades became an all-out pitching duel that spilled into a 10th inning on March 2. In the top of the first inning, Ohlone sophomore outfielder Stephen Zanders hit a double into center field that brought in sophomore Garrett Everhart for the first of their two runs in the 3-2 loss against Cosumnes River College. Ohlone sophomore pitcher Jackson Zarubin tossed five innings, shutting out the Hawks for the first four. 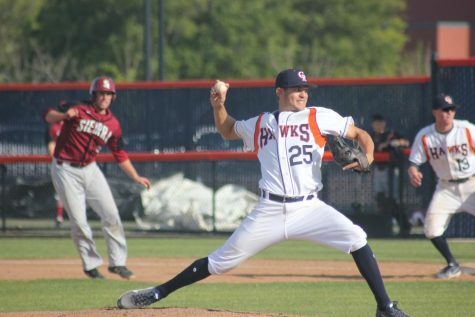 Hawks’ freshman pitcher Kyle Von Ruden matched his effort by pitching into the sixth inning before being relieved by sophomore pitcher Blake Harrison. Sophomore pitcher Anthony Amara pitched the 10th inning for the Hawks. Two of the Hawks’ runs came in the fifth inning. Zarubin walked the first two batters of the inning. 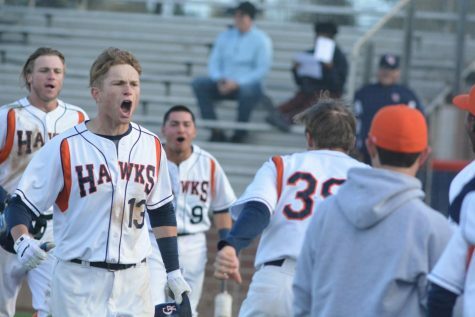 Hawks’ sophomore catcher Bryan Case stepped up to bat and hit an infield single to load the bases. 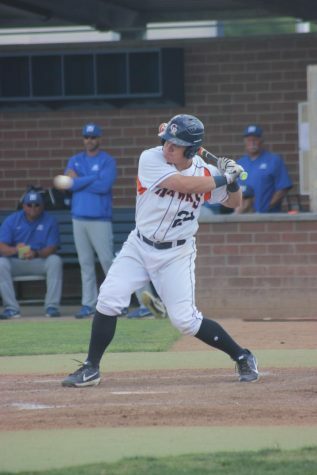 Zarubin then walked freshman utility player Zach Stilwell, which brought home sophomore infielder Luke McDonald for the Hawks’ first run of the game. Two batters later, sophomore outfielder Colby Wilmer hit a sacrifice fly to center field, batting in sophomore first baseman Garrett Heisinger. 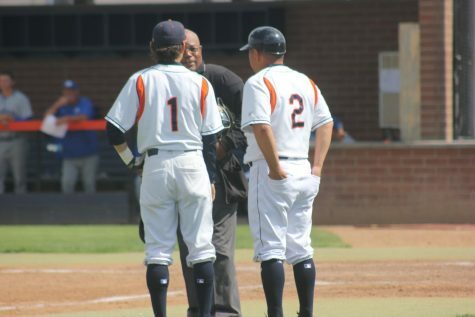 The Renegades’ second run came in the top of the sixth inning, when Zanders again brought Everhart home from third base, this time on a ground ball. 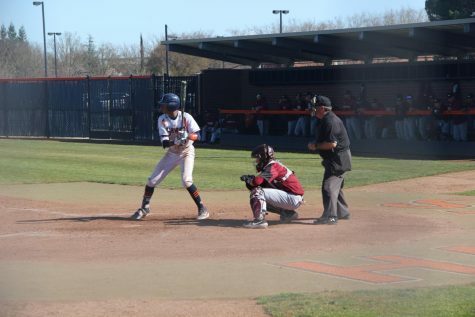 The Renegades had a chance to take the lead in the top of the ninth inning when Ohlone’s sophomore outfielder LJ Kalawaia hit into left field. 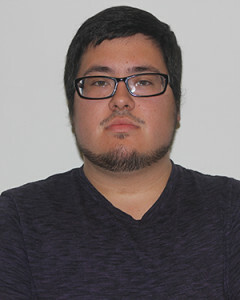 However, Ohlone’s freshman infielder Jacob DiThomas was thrown out at home. “We had the same situation yesterday, and he threw it over my head so I was just hoping to get it down and block the plate,” Case said. The bottom of the ninth was a three up, three down inning for the Hawks, bringing the game into extra innings. 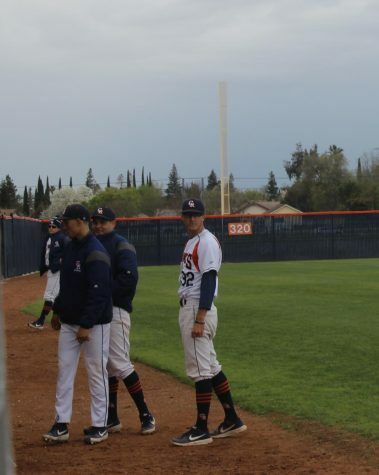 In the bottom of the 10th inning with two outs, freshman outfielder Josh Cosio hit a single, moving the pinch runner on first base, freshman Adam Castelan, to second. 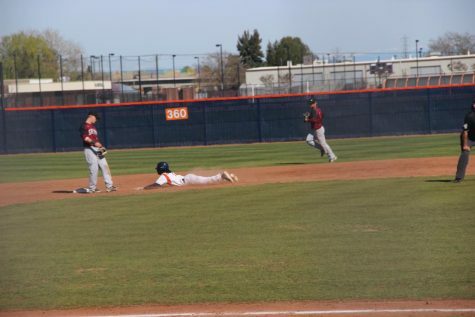 Freshman infielder Hunter Carolan hit into center field, bringing the pinch runner sliding past the catcher’s tag and into home for the game winning run. Bloomfield said that the team needs to improve driving in runs and scoring before their next game.